Although it’s still hard for me to tell the seasons apart in this part of the world (*aside from rain in January, I can’t tell the difference between most months in LA) it seems ‘summer’ is almost upon us again so time to shop for a new beach day look. 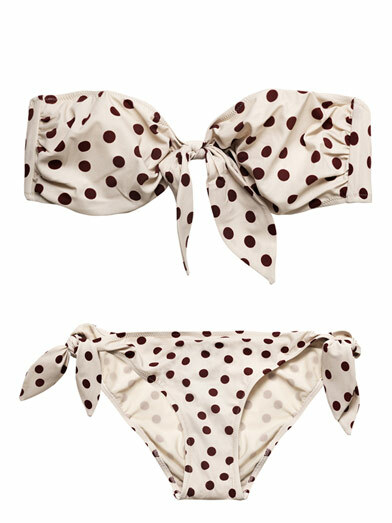 Dolce Gabbana halter neck bikini above and more below. Sperry Top Sider bikini top with a J.Crew anchor print bottom, striped bikini by Coach, string bikini by Mulberry, Melissa Odabash cobalt blue bikini, flower boy brief bikini from Peter Som, Chloe Mare white string bikini, DSquared2 halterneck bikini, Topshop polka dot bikini, Jean Paul Gaultier’s blue graffiti bikini, Missoni tropical flower print bikini, Dolce Gabbana’s bandeau bikini, Versace starfish print triangle bikini, and a Fisico reversible bikini. This entry was posted in Fashion and tagged Beach Fashion, Bikini Kill, Bikini Shopping, LA Fashion, Summer Trends, Trends. Bookmark the permalink.